Google Trends is an incredibly useful tool, yet often side-lined by marketers. It publishes aggregated search data that helps planners, researchers, UX professionals and of course marketers understand their audiences’ search behaviour as well vertical, regional and seasonal trends. Having that all important market intelligence equates to better campaign and content planning and therefore more successful digital campaigns. Google Trends aggregates search queries helping you understand the language of your target audiences. Below is an example of how consumers (in this case parents or parents to be) search for products using a variety of synonyms. In some cases, you can see interesting changes in consumer search behaviour across time. If you’re planning your editorial calendar, understanding seasonality is a critical factor. There’s no point in publishing content when your audiences aren’t likely to engage. In the example below, we can clearly see that (UK) audiences search for flu jabs around October, which (in this case) means that our content creation or curation efforts should take place in the summer for go live at the start of Q4. If you’re a global brand, never make assumptions about international trends until you’ve checked real datasets. Chances are you may be drawing incorrect assumptions about your regional audiences. Here we’re comparing how searches for “mountain bike” vary between the UK and Australia. UK audiences show increased search volume during spring and summer months, whereas Australians show more uniform searches across the whole year. This is most likely due to climate differences. Without looking at Google Trends, you’d be tempted to say that Australians search during their summer. If you’re interested in share of search, Google Trends provides aggregated brand search data, giving you insight into your competitive landscape. Here you can see a comparison between the four biggest DIY brands in the UK. Interestingly, they all exhibit similar year on year trends, giving you further insight into your audiences’ search habits. Similar to point 4, Google Trends allows you to monitor your brand search trends. If you’re pumping big budgets into brand marketing activity, you’d expect to see a rise in branded search. It’ll also let you monitor the impact of PR by selecting the “news headlines” checkbox in Google Trends. Here we can see the rise in popularity of the taxi app “Uber”. At the bottom of Google Trends, you will see related searches topics and queries. I find the top and rising queries particularly useful, as they help identify themes that will engage audiences hungry for content. Furthermore, if you’re using SEO tactics, embedding top and rising queries will increase your co-occurrence, helping you maintain your topical relevance in search. 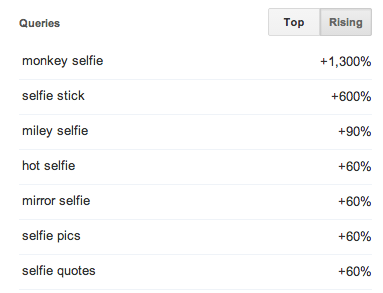 The example below illustrates what was trending at the time for the search query “selfie”. The highest trending query being “monkey selfie”; the story of the copyright dispute of a Macaque monkey’s selfie. The next trending query relating to an increasingly popular product – the “selfie stick”. If I was a blogger writing a piece on selfies, I know where I’d look to get my inspiration! If you want to learn how to do all of the above, sit back and watch our video guide on how to use, and the get the best out of Google Trends.